December 9, 2015 By Allyson 2 Comments This post may contain affiliate links. Read my disclosure policy. 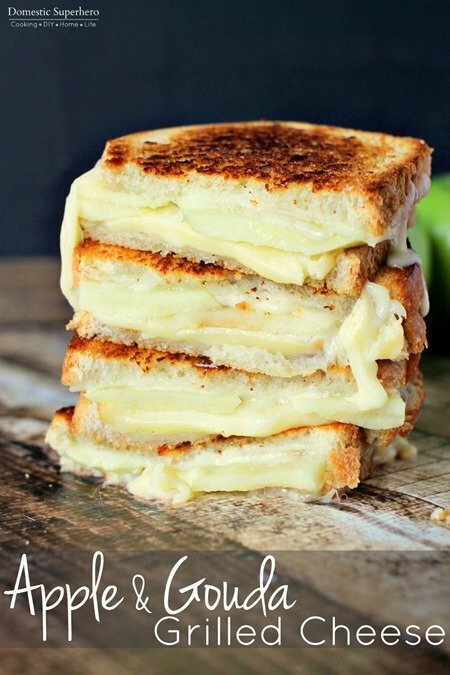 A typical weekend at our house always consists of at least one grilled cheese sandwich. I love coming up with different flavor combos, and lately I have been using a lot of spicy tomatoes around the kitchen. 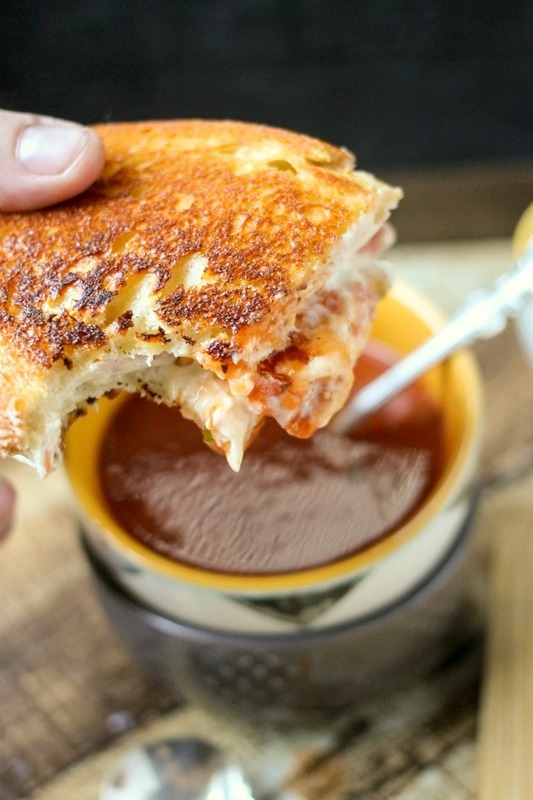 I knew throwing them into a grilled cheese would be a total win; then, serving it up with some easy peasy 15 minute homemade tomato soup – dinner victory! 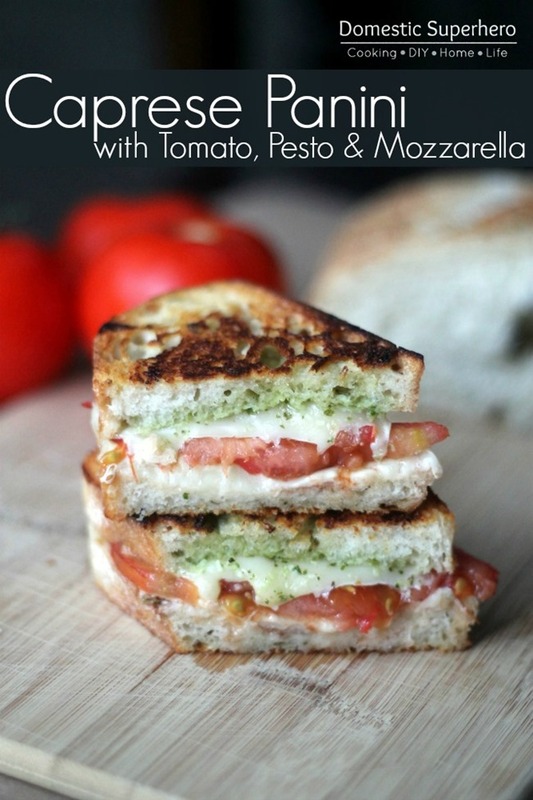 These Spicy Tomato Grilled Cheese sandwiches did not disappoint, and they were so tasty dipped into the hearty tomato soup! 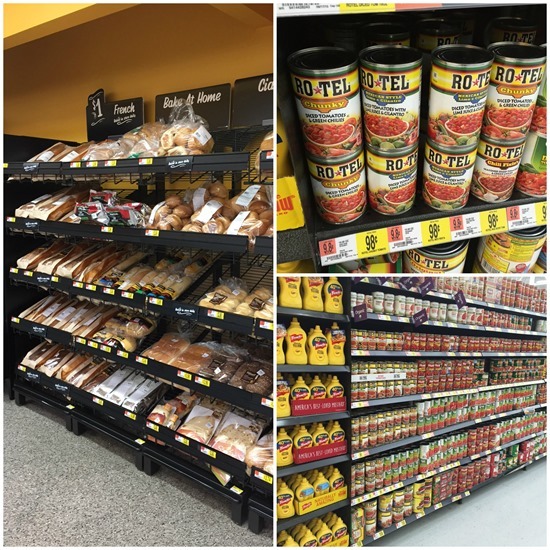 I headed to Walmart to pick up some RO*TEL, Hunt’s tomatoes, and fresh bread, along with my other ingredients! After I picked those up, all I needed was some cream cheese and pepper jack cheese, and I was on my way! Once I got home, I couldn’t wait to prepare these sandwiches. Now that the weather is getting cooler, I love a hot sandwich and soup – it’s really the perfect lunch or dinner! In a small bowl, I mixed the RO*TEL Chunky Diced Tomatoes & Green Chilies with some softened cream cheese. I was making two sandwiches, so I laid out 4 slices of my fresh bakery bread, added a slice of pepper jack cheese to each slice, and then slathered the RO*TEL cream cheese mixture in the center. I plopped them into my cast iron skillet and let them grill up. Don’t forget the butter on the outside of the bread – this will ensure a nice crispy outside! While my sandwiches were grilling up, I made the Tomato Soup, and it really couldn’t be easier. All you need is crushed tomatoes, broth, and some spices. Have all that simmering while you are fixing these sandwiches. Your whole family will thank me later! 1. In a large pot, add olive oil, onions and garlic and saute for 2 minutes over medium heat. Add crushed tomatoes, broth, basil, salt, and pepper; stir to combine. 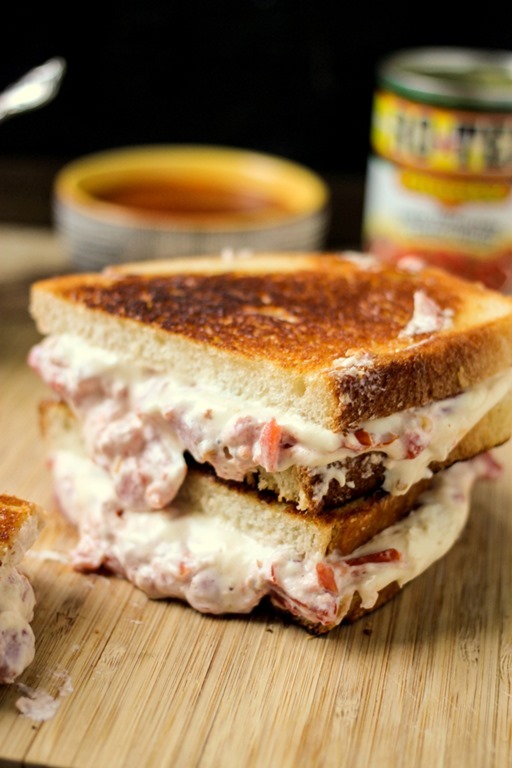 Bring to a light boil, reduce heat, cover and simmer while you make the sandwiches. 2. Puree soup using an immersion blender or transfer soup to a blender and puree (this can be skipped if you like chunky soup). 1. In a small bowl, combine softened cream cheese and strained RO*TEL; set aside. 2. Lay out your slices of bread. Place butter on the outside sides of each slice. 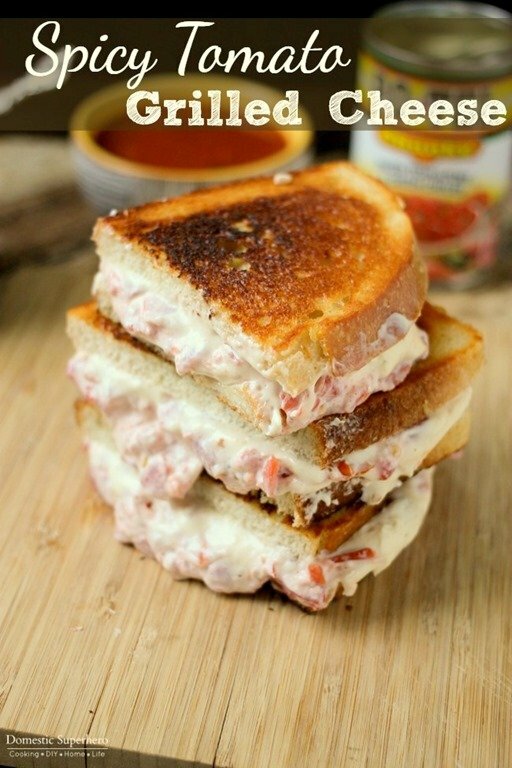 For the first sandwich, add a slice of pepper jack cheese, then half the tomato mixture - spreading it out evenly, then another slice of cheese. Top the sandwich with a slice of bread, leaving the butter on the outside. Assemble second sandwich in same order. 3. 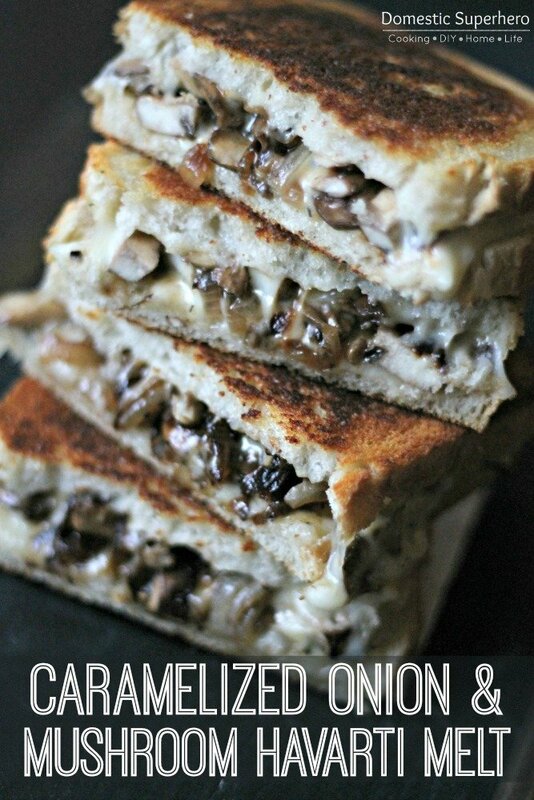 Heat a skillet or grill pan over medium heat; add sandwiches carefully. Allow to cook for 3-4 minutes over medium heat, until the first side is browning. Flip sandwiches carefully, and allow to cook for 2-3 minutes; this side will cook faster. Remove from pan and set aside. 4. Allow to cool a few minutes and then slice in half using a sharp bread knife. 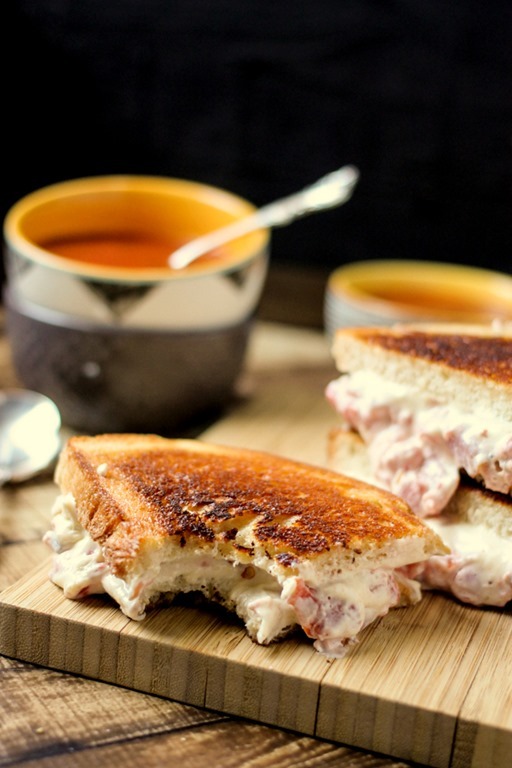 Serve sandwiches alongside a cup of soup - enjoy!